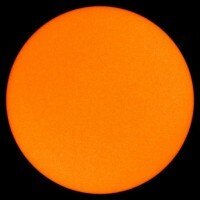 Sunday, August 30th marks the 51st straight day without a sunspot, one of the longest stretches in a century. One more day and we have a spotless month (we had some by some accounts one last August but a few observatories thought they saw a spot on the sun for a few hours one day). It would be either the first or second spotless month since 1913 depending on whether you count last August as spotless. In fact it rises into 4th place among all spotless periods since 1849 (first table here). Note: It is 5th place if you accept a spotless August 2008 which would have led to a stretch of 52 days. 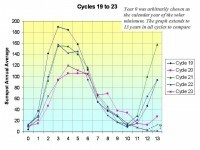 The total number of spotless days this transition from cycle 23 to 24 is now 704, exceeding the number for cycle 15 in the early 1900s (below, enlarged here). We have had 193 spotless days this year (79% of the days). We are in the top 20 years in 16th place. We will very likely rapidly rise up the list in upcoming weeks and rival 2008’s 266 days and likely end in the top 5 years. 2007, 2008, 2009 will only have 1911, 1912, 1913 in the top 20 as string of 3 per transition (below, enlarged here). The cycle minimum probably was December, 2008. 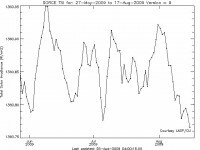 January 2009’s 13 month average came up a bit due to slight bump in activity in June and July but if August should end up sunspotless and September low, we could have a double bottom. Still, the 12.7 years assuming December 2008 was longest in two centuries (below, enlarged here). 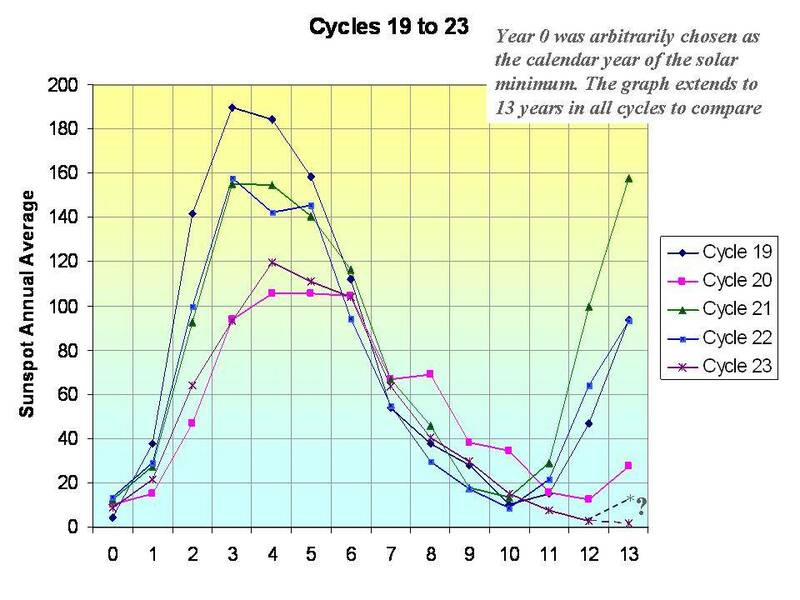 You can see on this chart, by 13 years after the solar minimum year, most of the last 5 cycles already had recovered, in one case already to the solar max of the subseuent cycle (below, enlarged here). 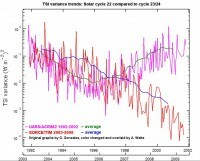 This cycle has continued to decline in the solar irradiance, solar flux, sunspot number and geomagnetic activity after 10 years. 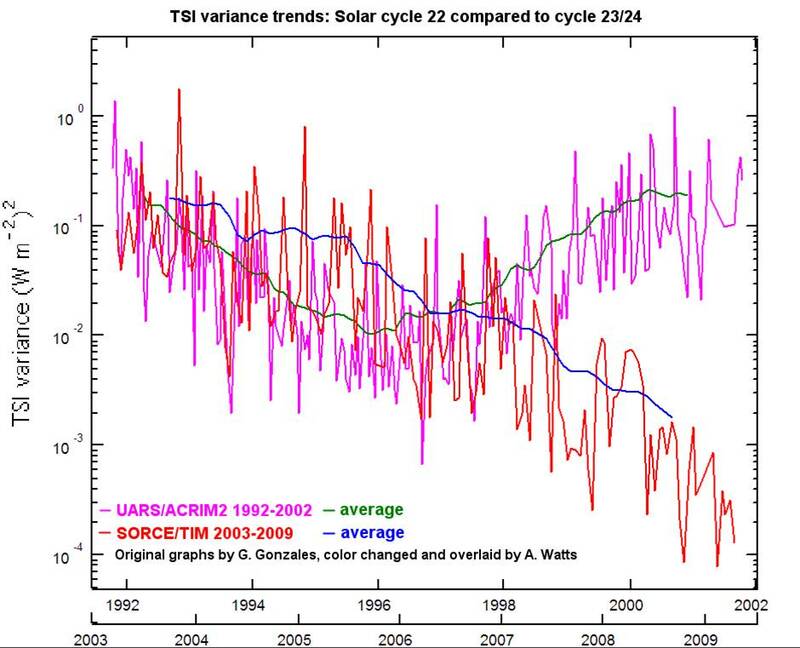 On the following chart produced by Anthony Watts, you can see the Total Solar Irradiance declining whereas the prior cycle was rebounding (below, enlarged here). Also see the daily TSI which goes through short term cycles at the lowest point of the last few months as of the last plotted measurement. 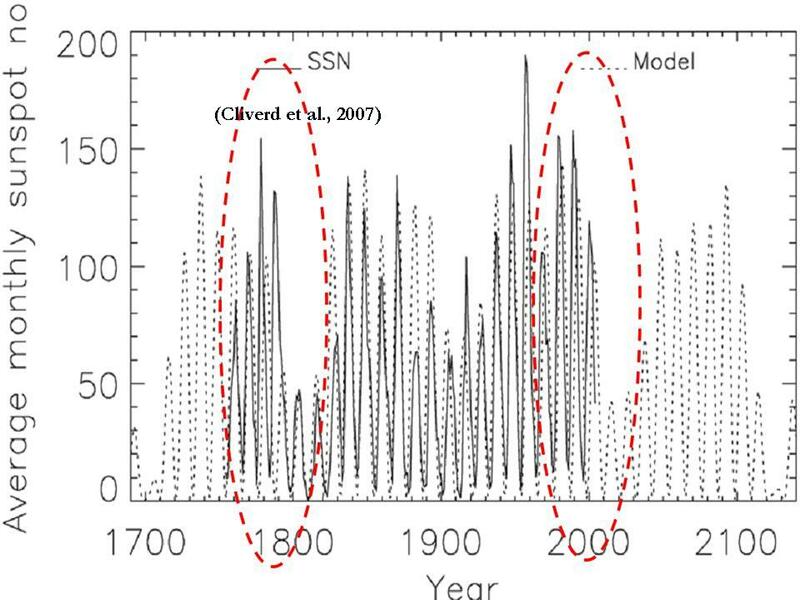 Clilverd et al 2006 suggests using a statistical analysis of the various cycles (11, 22, 53, 88, 105, 213, and 426 years) shows the next two cycles will likely be very quiet much like those of 200 years ago in the early 1800s, the so called Dalton Minimum, the time of Dickens (with snows and cold in London like last winter) (below, enlarged here). See what David Archibald shows what the result might be if Clilverd is correct here. Some have not ruled out an even stronger Maunder like Minimum. Read more in this pdf here. “The global warming doomsday writers claim the ice sheets are melting catastrophically, and will cause a sudden rise in sea level of many metres. This ignores the mechanism of glacier flow which is by creep: glaciers are not melting from the surface down, nor are they sliding down an inclined plane lubricated by meltwater…Variations in melting around the edges of ice sheets are no indication that they are collapsing. Indeed ‘collapse’ is impossible.” – Cliff Ollier and Colin Pain, writing in the newsletter of the Australian Institute of Geoscientists. Climate alarmism is like a runaway fire. It started quietly with a genuine concern. It was like lighting a match beneath a pile of flammable material. The environmentalists and politicians took over. The fact that the basic science is demonstrably false is no longer an issue. The welfare of nations is at risk. 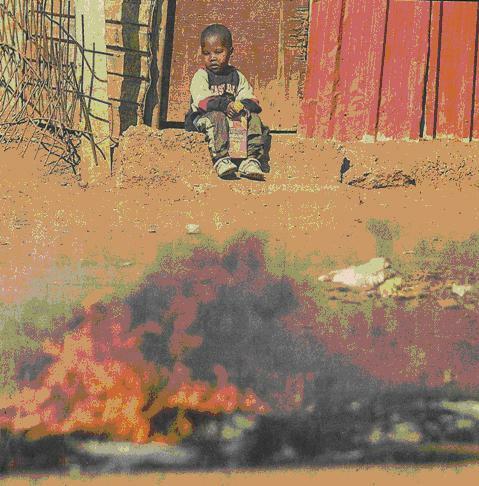 Child in an informal settlement looking at burning tyres. Photo in Beeld 29 July 2009. I had no sooner sent off my last memo The end is nigh on 10 August, when my prediction of imminent droughts was fulfilled. On 12 August our Minister of Water and Environmental Affairs announced that parts of the lower Limpopo River catchment have been declared a water supply disaster area. This is in the far northern region of South Africa. The Albasini Dam that supplies the Louis Trichardt area is only 26 percent full. The Middle Letaba Dam is only 6 percent full. On Sunday 16 August, prayers for rain were held in George, which is in the southern coastal area of South Africa. The dams in this region are also at a very low level. These two events not only confirm my prediction but also the views of others that global climatic disturbances are on the way. How will they affect the Copenhagen discussions and beyond? This is what the Secretary General of the United Nations had to say earlier this month. We have just four months to secure the future of our planet. If we fail to act, climate change will intensify droughts, floods and other natural disasters. Water shortages will affect hundreds of millions of people. Malnutrition will engulf large parts of the developing world. Tensions will worsen. Social unrest – even violence – could follow. This is a very serious message coming from the world’s highest elected official. But why did the Secretary General not address these climate change concerns within the wider context of humanitarian concerns instead of making it the greatest threat to our planet, which it is not? Let me make one point abundantly clear. Since the establishment of the IPCC in 1988 not a single person in South Africa has died as a result of provable climate change. But thousands have died from poverty-related starvation, malnutrition and disease. How dare those who call themselves scientists deliberately suppress this information? How dare they ignore the suffering of all these people? How dare they steadfastly refuse to participate in multidisciplinary studies where their alarmist theories can be demonstrated to be without foundation? Also, there is also no statistically believable evidence of linkages between climate change, and increases in the occurrence and magnitude of floods, droughts and threats to water supplies. Climate alarmist tactics are obstructing the right of these people to progress towards the normal lives that those in the western nations enjoy. This is the season of runaway fires in the southern hemisphere. The vegetation is dry after the rainless winter. These fires are beneficial in the grazing areas. If you fly northwards across Africa in the early evening there will be numerous twinkles of light from the controlled burning of the veld below you. This is to encourage growth after the first spring rains. The environmentalists complain bitterly. Think of the countless grasshoppers and other insects destroyed by the fires. [Think of all those locusts and other plagues if they are not!] Farmers control the fires by burning firebreaks early in the season. However, fires can sweep across the firebreaks during high winds and cause havoc. In our part of the world there are other areas vulnerable to runaway fires. These are the crowded shacks in the informal settlements around our cities. Not only do the shacks consist of flammable material, but in the absence of electricity, the inhabitants use flammable paraffin for cooking and lighting. The shacks are crowded together leaving no room for firefighting vehicles. Unlike those living in the adjacent suburbs, the occupants of the shacks cannot afford insurance. When the fires occur they lose everything that they possess. In South Africa, the number of homeless people is rising. These people are clamouring for basic services of housing, water, electricity and sanitation. The government cannot keep up with their demands. As a result another flammable situation is developing. The burning of old vehicle tyres on the streets and obstructing the traffic has become a means of attracting attention and getting their message across. The affluent nations influenced by heartless and scientifically disabled climate alarmists consider that the rising amount of so-called greenhouse gases (mainly carbon dioxide) discharged into the atmosphere from coal burning power stations and transport, are a far greater threat to national welfare than unemployment, poverty, malnutrition and disease. Nowhere in the climate change literature will you find a balance between humanitarian concerns and environmental concerns. Instead, while our people are starving, powerful and influential bodies such as the G20 nations, meet regularly at international pleasure resorts to discuss the situation over delicious meals and refreshments. Unfortunately, like a runaway fire, the situation is now out of control. A firefighting mechanism (the successor to the Kyoto protocol that expires in 2012) has to be established in Copenhagen not later than December this year. The likelihood of success is receding by the day. 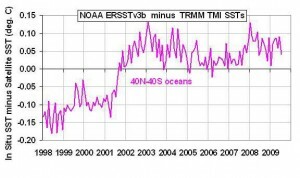 NOAA Blunder Explains Claims of Warming Oceans? SCIENTISTS at the National Oceanic and Atmospheric Administration (NOAA) Climate Prediction Center (CPC) appear to have made a blunder with a data adjustment and splice resulting in sea surface temperatures being warmer than they would otherwise be by about 0.175 degrees C over the last two decades. Roy Spencer, from the University of Alabama, discovered the error just a few days ago which according to meteorologist Anthony Watts, accounts for 24% of the 0.74 deg C global warming claimed for 1905-2005. The mistake was made about 10 years ago following a request from the World Meteorological Organization for NOAA to standardize the period from which temperature anomalies are calculated. 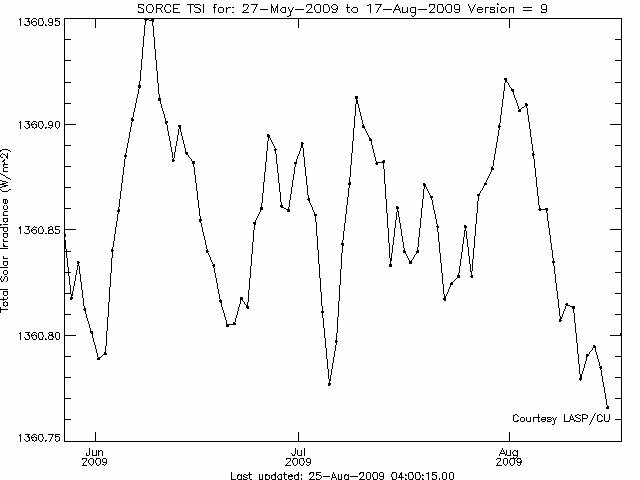 I have puzzled as to why Australian government advisors claim sea temperatures have been increasing over the last ten years – perhaps they have been referring to sea surface temperatures and focusing on this dud data. Changes in the sun’s radiation cause a small La Niña-like effect on earth, an international team has found. They say this together with another process involving ozone in the upper atmosphere, amplifies the effect of the sun on earth’s climate. Australian climate scientist, Julie Arblaster of the Bureau of Meteorology in Melbourne and colleagues report their findings in today’s issue of the journal Science. “It’s a small signal but it does explain some of our climate variability,” says Arblaster. Scientists have long known that more sunspots increase the amount of radiation that reaches the earth. 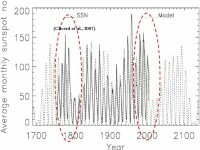 The total energy that reaches earth from the sun varies by around 0.1% across an approximate 11-year solar cycle, say Arblaster and colleagues. But what has long puzzled researchers is that the influence of this variation on the earth’s climate has been more than two times greater than would be expected. Arblaster and colleagues have investigated a number of theories as to why this is the case and think they may have solved the mystery. “We’re trying to understand the mechanism of how this change in the solar output amplifies in the climate in terms of temperature and rainfall,” says Arblaster. CO2 is not a pollutant, but a naturally occurring gas. Together with chlorophyll and sunlight, it is an essential ingredient in photosynthesis and is, accordingly, plant food. Temperature changes lead, not lag, CO2 changes on all time scales. The oceans may play a key role, emitting carbon dioxide when they warm as carbonated beverages lose fizz as they warm and absorbing it as they cool. The sun has both direct and indirect effects on our climate. Solar activity changes on cycles of 11 years and longer. When the sun is more active it is brighter and a little hotter. More important though are the indirect effects. Ultraviolet radiation increases much more than the brightness and causes increased ozone production, which generates heat in the high atmosphere that works its way down, affecting the weather. Also, an active sun diffuses cosmic rays, which play an important role in nucleation of low clouds, resulting in fewer clouds. In all these ways the sun warms the planet more when it is active. 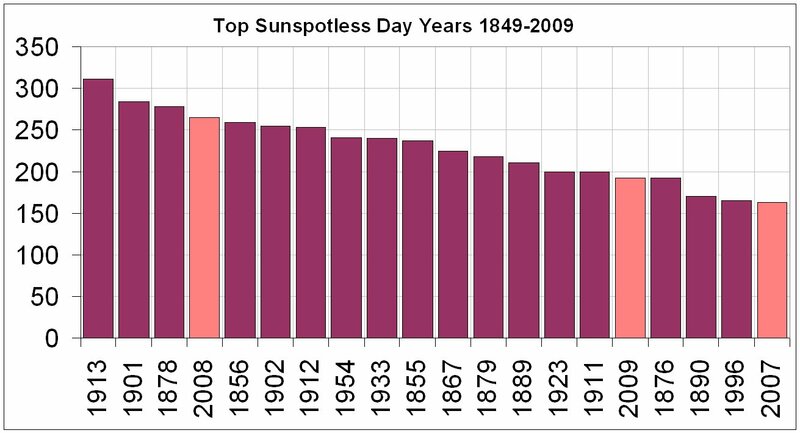 An active sun in the 1930s and again near the end of the last century helped produce the observed warming periods. 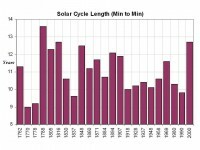 The current solar cycle is the longest in over 100 years, an unmistakable sign of a cooling sun that historical patterns suggest will stay so for decades. accelerated in the last year, and the Atlantic has cooled from its peak in 2004. This supports the observed global land temperature cooling, which is strongly correlated with ocean heat content. Newly deployed NOAA buoys confirm global ocean cooling. Warmer ocean cycles are periods with diminished Arctic ice cover. When the oceans were warm in the 1930s to the 1950s, Arctic ice diminished and Greenland warmed. The recent ocean warming, especiallyin the 1980s to the early 2000s, is similar to what took place 70 years ago and the Arctic ice has reacted much the same way, with diminished summer ice extent. See pdf here (first published in the Energy Tribune). At the turn of the 20th century, a period famous for its Robber Barons, John D. Rockefeller was making his fortune in oil, Andrew Carnegie in steel, Cornelius Vanderbilt in railroads and J.P Morgan in finance. Many predict that the history books of the future, when listing the legendary fortunes made at the turn of the 21st century, will place Al Gore at the top of the list, as the first great Carbon Baron. In 2000, when Al Gore lost his bid to become president of the United States, he had less than US$2-million in assets. Neither was Gore known for his financial acumen — annual White House disclosures of his and Tipper Gore’s joint tax filings showed little income beyond the $175,000 he earned as vice-president. Nobody doubts Gore’s financial acumen now. Within eight years of leaving politics, Gore had reportedly become worth well in excess of US$100-million. Many expect him to become a billionaire through his stakes in a global warming hedge fund, a carbon-offset business, a renewable energy investment business and other global warming related ventures. He is now money manager to institutional investors and the super rich through Generation Investment Management, a firm that he co-founded in 2004. Gore’s societal plan and his investment plan are indistinguishable and straightforward: He wants to make fossil fuels uncompetitive and renewable energy competitive by convincing governments to punishingly tax fossil-fuel technologies through mechanisms such as cap and trade. In the process, Gore intends to make money at every stage of this transformation — through his stake in the carbon trading markets being created, through his portfolio of renewable energy and other so-called clean-tech investments and by acting as a broker. The character of warming cycles in the tropics. The usefulness of the ENSO 3.4 Index as a proxy for tropical warming events. The driver of sea surface temperature change in the tropics. Change in the nature of this driver over time. The contribution of warming cycles in the tropics to global temperature change. The place of greenhouse theory in explaining global temperature change. Global temperature is strongly influenced by change in sea surface temperature in the global tropics. There is a lag of about six months from tropical to global peak. There is no argument as to the driver of global temperature on a year to year basis. Until recently many observers (including the UNIPCC) have maintained (without any justification whatsoever) that the ENSO oscillation is temperature neutral on decadal and longer time scales. That assertion is now widely questioned. We must ask how much, and whether all of the change in global temperature can be attributed to the cycles of warming and cooling in the tropics. The strong temperature gain between 1978 and 1998 has been attributed to man’s influence on the basis that “we know of no other reason for the change that has been observed.” That logic is now in question. Was something really obvious simply overlooked? There is still no evidence for the greenhouse induced ‘hot spots’ in the upper atmosphere. Is the UNIPCC assertion that the recent warming is due to the activities of man classic case of jumping to premature conclusions in the face of abundant evidence to the contrary. Frequently the collapse of a solar cycle is associated with cooling in the tropics while the onset of a new cycle is associated with the initiation of a strong warming event. However, Cycle 24 is unusual. The sun is spotless even though 10.7cm radio flux has been increasing since late 1998. Just when is the big warming event to be expected and will it be as big as 1997-8? But probably nothing could damage the credibility of climate change believers than the recent revelation by the Climatic Research Unit (CRU) that it has lost or destroyed all the original data used to construct historic global temperature records. The CRU, at the University of East Anglia in the UK, which has been using information collected from weather stations across the globe for decades, is probably the most widely cited source worldwide for those mounting a case that the earth has exhibited an inexorable warming trend: its website boasts that CRU’s research has “set the agenda for the major research effort in, and political preoccupation with, climate research.” The critical raw climate data responsible, which scientists of all climate-creeds have a natural interest in, is now gone, apparently, forever. With the exception of a handful of countries that the CRU has agreements with to sell its data, all that remains for the bulk of the statistics are “value added” versions, which is to say, consolidated, homogenized data. Actually, the CRU says it doesn’t even have all the data for countries it has data-sharing agreements with. “We know that there were others, but cannot locate them, possibly as we’ve moved offices several times during the 1980s,” the CRU writes in a rather embarrassing explanation for all this posted on its website.